So here we are... Autumn is in the shadows of the once coloured trees and winter is laid out before us in 3 in-stall-months of Cold, VERY cold and in the last month it’s a little less cold, so now you can start looking forward to spring. I don’t know about you, but I for one am a summer baby. Oh South Africa is such a great country to live in during these seasons. Let’s not lie, we have it easy during the cold months in comparison to some other countries out there. With clear blue skies above us, all we need fear is that dreaded wind that pierces through any number of layers of clothing you might be wearing. For me, this time of the year is generally hibernating season. Get home from work, make a quick warm dinner and curl up on the couch with my blanket and stay as roasty toasty as I possibly can. Weekends have much the same couching activities unless invited to a restaurant or someone’s home with a fireplace. My outdoorsy nature takes a quick 3 month break till spring arrives. Spring has this magical power surrounding it. It somehow makes me feel re-born, re-vitalised, rejuvenated. Probably all that energy I saved up over winter! I want to start exercising again, eat healthy, re-decorate, fix the broken dining room chair that has been broken for 6 months, spring clean, go to every outdoor event, re-do that coffee table that I have been meaning to do for the past 5 years, listen to music at the highest of volumes because I’m so happy, make something special for someone (also been meaning to do for at least 3 years), bake, find new recipes, shop till I drop… and so much more. Where do I get the time to do all of this you ask? I don’t. I am so busy exercising, going to events and socialising that I don’t want spend my time at home, trapped like I was for the past 3 months, bound to my chores of fixing broken chairs, re-decorating, re-doing coffee tables and making things. These were once considered my great new projects. Now diminished in my mind I cast them aside for another day, another month, another year. Well I am here to tell you that this year I am going to put a swing on things. No more hibernating on weekends during the perfectly dry weather conditions. No more waiting to feel inspired by spring to re-do anything. Inspiration does not have a season I tell you! Doing these great projects while they still feel great in my mind now during winter, allows me to enjoy them and show them off during my summer pool parties. Where did I find my sudden inspiration that gave me my light bulb moment? 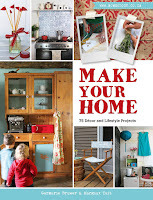 Besides the obvious shop I love to be inspired in, Crafters Market, I recently came across a little book by Penguin Random House called “Make your Home”. Upon reading the book, I realised how many of these and my projects are done indoors, sheltered from the harsh elements I so quickly hide from. Simple, easy to do projects from creating a gift wrapping station to making your own stencilled décor boards! 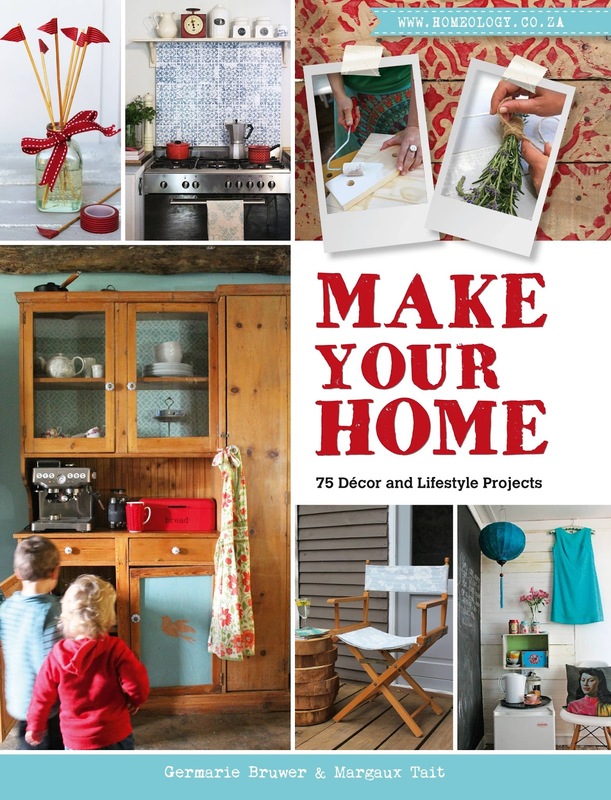 The authors cover topics like Storage, Lighting, Walls, Furniture, Fragrance, Prints and so much more all jammed in 75 Décor and lifestyle projects. With this amount of content, there is a little something and even more for each personality type out there. With easy to follow instructions and great photography this beautifully made and well written book gave me the re-juva-inspiration required to ignite my eagerness and willingness to get cracking on my projects. I absolutely love crafting, upcycling and repurposing things around my home, and so do these authors. What better time to do this than “now” first of all, and also “now” while I lie in wait for my precious warm months. Being the avid crafter that I am and also want to be, I always have a certain amount of standard items I have in my project room, also known as my “do not disturb me when I’m in my workshop” room. It was a pleasant surprise to see that I can do so many of the projects in my new “Make your Home” book with what I have already purchased from Crafters Market. Namely: Craft paint, Chalk paint and liquid wax, Modge Podge, Stencils, Pegs, Craft glue, Stamp kits & inkpads, Paint brushes, Wooden cut outs, Washi Tape and Ice cream sticks. The first project I am going to be doing from this book with my Crafters Market goodies is “Herb Markers”. When spring comes around I always like to plant some herbs and veggies. I just love this cute and very trendy idea of marking what I have planted. I will never find the time to do it while planting and will just tell myself to rub the leaves and smell it to find out what it is. So, I am going to prepare myself before I procrastinate or talk myself out of such an easy and beautiful project. If you want to be inspired like me, you can purchase Make your Home or the Afrikaans version, Skep ‘n Tuiste, from http://www.randomstruik.co.za/books/make-your-home/6021. Then contact or head over to your nearest Crafters Market store, we have 13 stores across Gauteng and Mpumalanga, for your craft supplies. Remember, there is no better time to be inspired than now. Re-ignite your creativity!